Often it is the fine details that truly bring a design into focus. 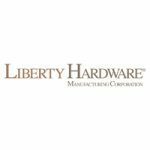 For over 60 years Liberty Hardware® products, which include decorative and functional hardware, have combined classic designs with unmatched durability and quality. Our products are handsomely produced in solid brass, wood and porcelain, including collections inspired from nature, world cultures and fine art.